I've been working on designing a blaster stand worthy of the famous Blade Runner blasters. 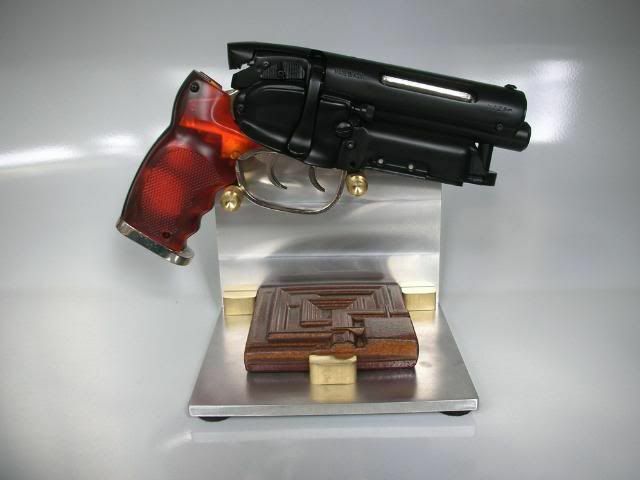 With the amount money folks are spending on the blasters I thought there might be a few who felt that a high end prop gun deserved a high end stand. This particular stand is what I refer to as the "Tile Stand." It uses a licensed Ennis House tile as designed by FLW. My other design is still in progress, but will use one of the police badges or emblems on the upright, and have a shallower base. 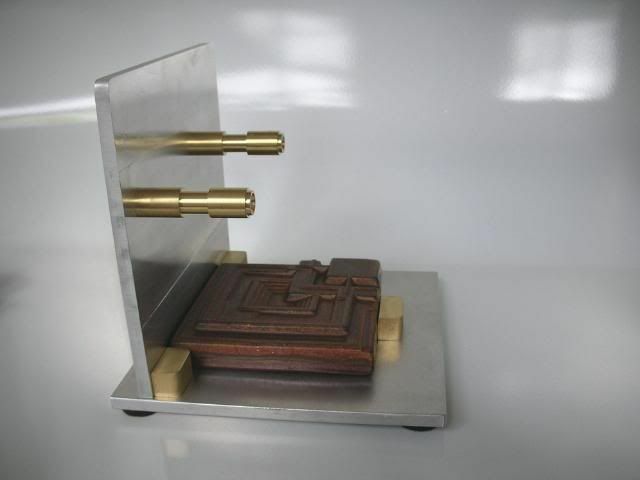 The stand is all aluminum with brass pieces used as gussets and to retain the tile. 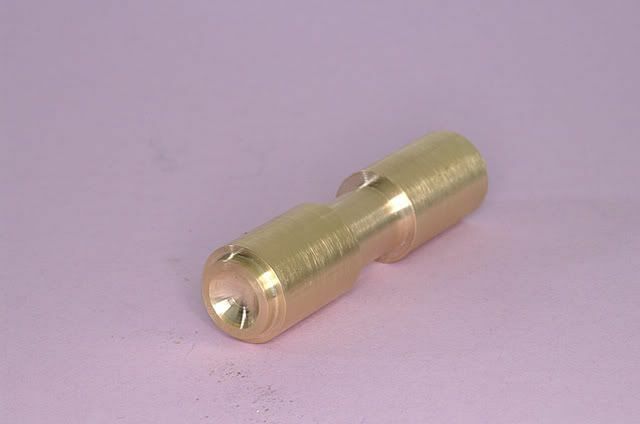 The pegs are custom machined brass with lathe cut detailing and have a "relief" cut into them to center the gun and keep it away from the aluminum wall. No glues, everything tapped and threaded for screws. If you want to secure the gun to the stand, simply use some coated stainless steel aircraft cable (very small diameter) and loop it around the gun and drill a hole in the stand (hidden by the gun) to pass it through. You can then secure it with loops and a small lock, etc. I don't know if there is any interest in these at all, but at least I have one for my own blaster. I am awaiting my Worldcon blaster and hopefully the Second Version of my stand will be finished when it arrives. If I could sell these for $95.00 each plus shipping (TILE NOT INCLUDED) would anyone be interested? I can include the tile, but it is an additional 40 or so bucks so I'd rather give you the info on how to order your own. I know this one is a little pricey, but alot of machine work goes into it. I am working on one with a a simpler design that means less machine shop time so it can be offered at a lower cost. It will not incorporate the tile, and will ba a bit smaller. I am also working on a third version with a badge as part of the design. Great project, Eltee. I think it is a fantastic idea to offer three versions -- one with tile, one with badge, and then the most simple "no bells or whistles" version that allows people who take the "less is more" philosophy or, like me, who are on a budget, to display their prop. I have a metal version of this prop, so all I would ask is that you make sure the stands can hold up a metal version of this prop without tipping. I would consider the badge version, but as I do often like stands that are understated, I may go for the simple version, should you decide to offer one. Thanks for all the progress pics and taking this project on. The Tile Stand shown holds my all metal Coyle blaster. All stands will be engineered to address top heaviness and toppling concerns. All connections are drilled, tapped and screwed plus the design elements double as gussets. May have some pics up later today or tomorrow. Here is a pic of a different version. Note the pegs which are 100% brass and can be polished if desired. 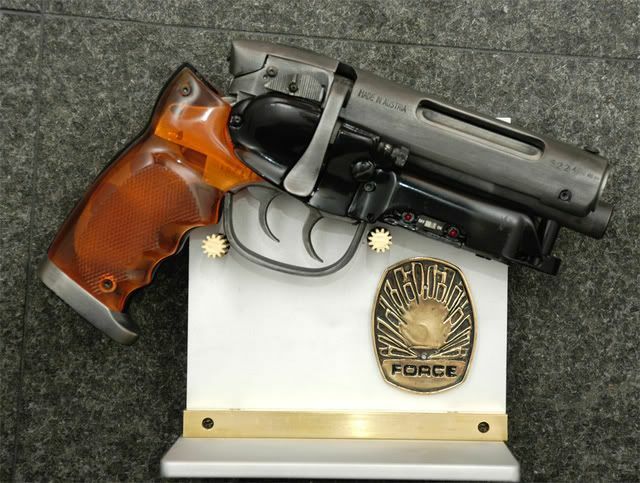 This is a prototype incorporating a brass "Force" badge. Perhaps anyone who gets one can add their own photo to the middle, or add one of Deckard. The plates are all aluminum, but media blasted for a softer, matte effect although they look white in the photo. The badge would normally have the photoring surrounding the photo. On this prototype, the screws going into the brass gusset are showing but on a production one I would use hidden screws. Also, I would cut the back plate so that exposed corner wouldn't be visible. This one is also very sturdy and designed not to fail or topple with an all metal blaster. how soon before these are for sale? Once I can do some value engineering to get production costs down, I'll post a price. It is difficult because it is labor intensive and involves metal cutting, finishing, drilling, tapping and the cost of materials. I am looking to provide one more style, a bare bones basic stand with no badge, no tile but using the same basic build. It would be shorter top to bottom since no need to provide space for a badge, and shorter front to back since no tile. It would probably look very nice with a rectangular data plate, such as provided by the RAC blasters made by Rich Coyle. Posted: Thu Aug 14, 2008 5:57 pm Post subject: ???? It's been a month -- any updates? I would really like to order one of these. 2. The badge version or use an ID plaque, etc. 3. 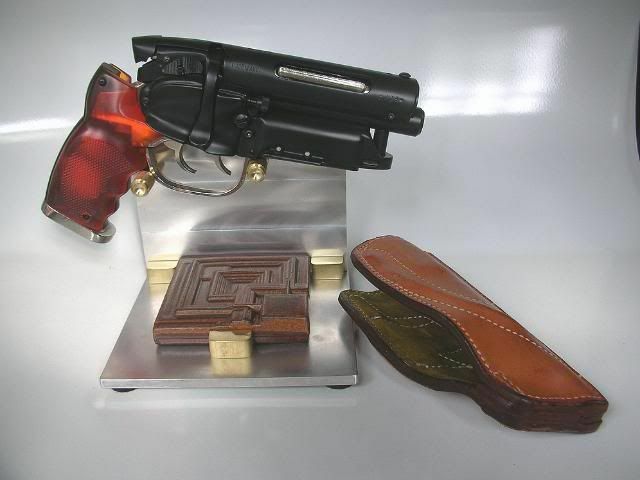 Gun only version, shorter and only holds the gun. Let me get firm prices from the machinist tonight. When you put up the prices, you might like to include pictures of all three styles of stand together in one post (including the basic no-tile, no-badge version; I don't think we've seen that one yet) for easy comparison. These are the most elegant, sophisticated stands for the all-metal Blaster I've seen. Beautiful work, eltee. Thanks for the comments. The problem is that they are a little labor intensive to make. Aluminum and brass stock has to be cut, shaped, drilled, tapped, etc. My machinist says he will do more if I get five orders of one style, otherwise it will be costly to you guys. I've trying to cut corners to save production costs. The aluminum plate stock comes nicked, scratched and unfinished. If buyers were willing to finish up the aluminum themselves it would save money. You can polish it with a pad, have it media blasted, paint it, etc. The ones shown so far were finished in the shop. I'll hear from him later today. Any update on these? Been looking for a great stand for awhile, would much prefer to buy one rather than find the time to make one. I would be happy to order the 1st version stand and tile if they are available. Please let me know if it's possible, i will pay up front if it helps. Posted: Wed Nov 26, 2008 11:54 pm Post subject: Stand With Blaster And Lenticular Frame. I just recieved my stand and i am most happy with it! 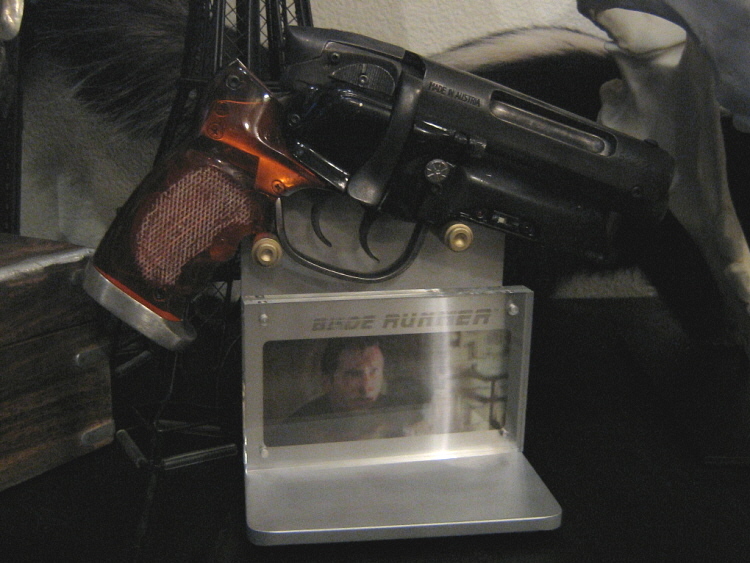 I was going to do a metal name plate, when i realized the lenticular frame with Deckard with his M2019 fits on and matches in color to the stand perfectly! This stand and the lenticular frame were meant for each other! Thanks for a great stand! Build quality is top notch! It compliments the blaster very well! Great pairing of the stand with the lenticular plate. Now THAT's what I call a flash of inspiration! Thanks, panzerune, for sharing this with us. Looks GREAT! Yes, the stands are available for purchase.